Let relief come to all people impacted by pollution and climate change. Let NRG Energy work with us to end the burning of coal and to bring clean energy to our community. Let us have the strength to continue our struggle for environmental justice. Let our community, our lakefront and our environment enjoy a rebirth. These simple prayers seemed to carry special power on Sunday, November 1, when voiced by Waukegan faith leaders and more than 150 Lake County residents commemorating Dia de los Muertos in a march and vigil organized by the Clean Power Lake County Campaign. Near the coal plant, they listened intently as speakers explained how industrial pollution in Waukegan continues to pose significant health risks for local residents. They also heard how ongoing pollution from the NRG coal plant stands in the way of vibrant economic redevelopment that might attract recreational tourism and new businesses to Waukegan. Together, they called on Waukegan Mayor Wayne Motley to bring NRG Energy to the table to set a clear retirement date for the coal plant and establish plans to protect impacted workers and remediate the site. Building on that strong sentiment, Clean Power Lake County supporters have begun collecting petitions addressed to Mayor Motley and Waukegan’s City Council. The petitions urge Motley to convene a transition task force to plan for the future of the NRG coal plant site so Waukegan can move forward as a healthier community with meaningful options for lakefront revitalization and economic growth. Click here to sign the Clean Power Lake County petition for clean air in Waukegan and Lake County! As morning showers gave way to afternoon sunshine on August 23, approximately 120 Lake County residents headed to the beach on Waukegan’s beautiful lakefront to rally for clean air, clean water, and clean energy. First, we swept the beach and the adjoining dunes to take care of the pollution we can control–like litter–as part of our second annual beach cleanup. Then we called for NRG Energy to act to retire its old and dirty coal-fired power plant, which stands less than a mile north of Waukegan’s swimming beach. “For too long, corporate polluters like NRG Energy have taken advantage of our lakefront and made our families sick,” Maryfran Troha told volunteers as they finished the August 23 cleanup. Troha, a lifelong Waukegan resident, represents Clean Power Lake County coalition partners Christ Episcopal Church and the League of Women Voters of Lake County. “I’m sick of it. I’m ready for a clean Waukegan for all of us because we deserve so much better,” Troha said. The most immediate thing we can do to help protect Waukegan’s lakefront is to attend the Illinois Environmental Protection Agency Clean Air Act hearing on September 2, 2015. The hearing will focus on the operating permit for NRG’s coal-fired power plant in Waukegan. RSVP to stand with Clean Power Lake County and Sierra Club to fight for clean air in Waukegan and Lake County! 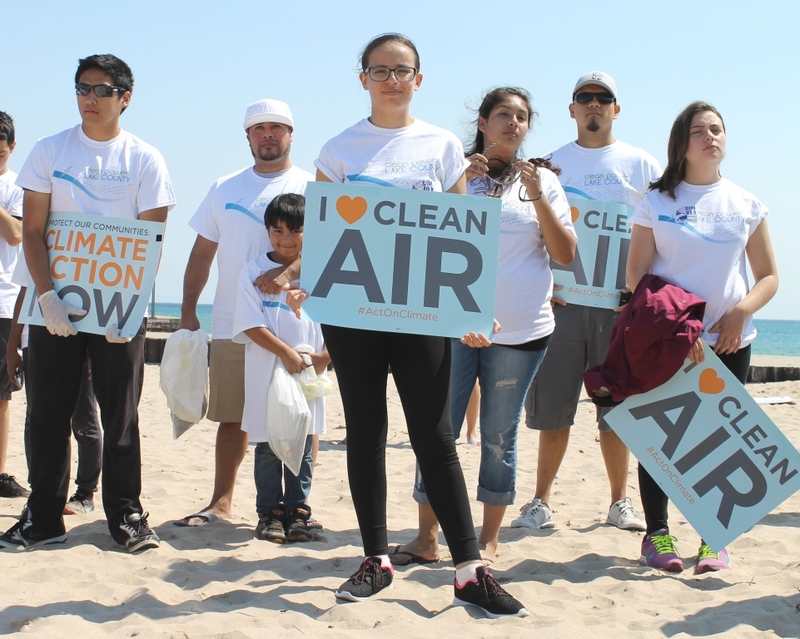 When: Wednesday, September 2, 2015, 7 p.m. .
A year ago, the Clean Power Lake County Campaign gathered more than 120 people from all walks of life to clean up Waukegan’s Municipal Beach and to demand new clean-energy policies for their hometowns. Students, parents and senior citizens had one thing in common: outrage toward NRG Energy, whose coal-fired power plants are some of the worst carbon polluters in Illinois. NRG’s coal plants have faced numerous lawsuits for violations of the Clean Air Act, violations related to high levels of dangerous pollutants in groundwater near coal ash dumps adjacent to the coal plants, and repeated sulfur dioxide violations. Clearly, standing together makes us stronger. Now we have another opportunity to stand together. 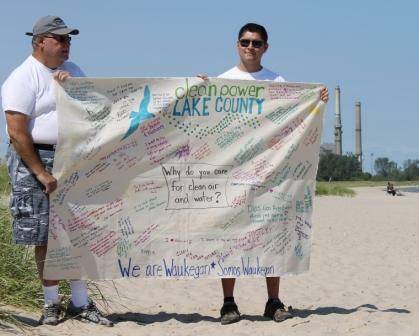 The Clean Power Lake County Campaign will host its second annual Waukegan beach cleanup on August 23. Together, we will celebrate our beautiful lakefront and discuss how we can protect it in the long run. When: Sunday, August 23, 2015, 1 p.m.